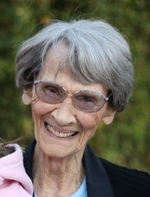 Nina Simpson Lytle, 88, of Las Cruces, NM, passed away Wednesday, February 27, 2019 at The Village at Northrise. She had been anxiously awaiting the birth of her latest great-grandchild who was born that morning. Once she knew that the baby was here and healthy she was at peace and took her last breath. Nina was born December 19, 1930 in Lovington, New Mexico, to Willard Ovid and Era Viola Aker Simpson. She graduated from Lovington High School in 1948 where she was the State President of Future Homemakers of America, Student Council President, a member of the chorus and voted “Best Club Worker” and “Best All Round Girl”. In her senior year she was elected as the first National President of FHA. She moved to Las Cruces to attend NMSU where she was President of the freshman class and a member of Zeta Tau Alpha. There she met Robert (Bob) Lytle and they married in 1949. She enjoyed a long career as a bookkeeper and at the time of her retirement she had been the bookkeeping supervisor at Kriegel & Company for 25 years. When she was living in her home, Nina gardened and had a special fondness for roses. She also usually had a cat that she lovingly draped across her shoulder as she drank her morning coffee. After retirement her favorite pastimes were organizing her pictures and playing music on her computer. She enjoyed the company of others and always had something positive or witty to say. Above all, she was a loving and devoted wife, mother and grandmother. In recent years, nothing would bring a smile to her face quite like photos of and stories about her great-grandchildren. Nina was preceded in death by her husband of 61 years, Bob, in 2010; her parents, three sisters, four half-siblings and her daughter-in-law Cindy Venable Lytle. She is survived by her son Robert H. Lytle III and wife Laura; two daughters, Priscilla Johnson and husband Richard and Bea Kuckens and husband John of Las Cruces. She is also survived by grandchildren Erin Johnson Magee, husband Michael and their daughters Ella and Morgan of Dallas, TX; Stephen Johnson and wife Sarah Fouillade Johnson of Las Cruces and their newborn daughter Harper; Jonathan Lytle, his sons Landon, Jeremiah and Peyton of Augusta, GA and Suzanna Lytle, also of Augusta. All who knew her feel this loss deeply and will miss her greatly. The family would like to thank Dr. Silvia M. Sierra for more than a decade of compassionate care. We would also like to thank the staff of The Village at Northrise Morningside who have been her second family for the last year as well as the team from Ambercare Hospice for their guidance and support these last few weeks. A visitation will be held at 9 a.m. on Monday, March 11, 2019 at Getz Funeral Home Chapel where the funeral service will follow at 10 a.m. Burial will follow at Hillcrest Memorial Gardens Cemetery where she will be laid to rest next to Bob. Officiating will be Pastor Christy Taylor. To send flowers to the family of Nina Lytle, please visit our Heartfelt Sympathies Store.